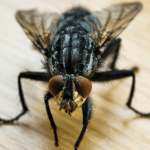 Flies, Maggots Extermination Suffolk County | EcoTech Pest Control Inc. FLIES are a common pest all over the world. Flies sole purpose in life is to find rotting organic material and lay eggs in it. This could be a dead animals carcass, or food that’s been left out, garbage pails or dumpsters left unattended, or old rotting vegetable matter. The FLIES will find the rotting substance using a keen sense of smell, land upon it, and lay eggs just beneath the surface. They will then eat some themselves, and regurgitate some back out, mixed with some acidic saliva that will aid in the decomposition of the rotting matter. In about 2 days the eggs will hatch and larvae will emerge. We know these larvae as MAGGOTS. The MAGGOTS will writhe around in the rotting substance, ingesting constantly as they go. They will aid in the decomposition process of their rotten food source by creating ammonia as they eat, regurgitate and defecate. After feeding for a few days, the larvae will crawl out of the muck and pupate to become adult flies. If you are experiencing an infestation of FLIES, odds are you either A) have a bag of garbage/garbage can that hasn’t been put out in over a week, or B) you have a dead animal somewhere in your home. In either case, you need to have a professional come in and put an end to the life cycle of these pests IMMEDIATELY. A TRAINED ECOTECH TECHNICIAN CAN QUICKLY RID YOUR HOME OF ALL ADULT FLIES, MAGGOTS, AND EGGS WHILE ALSO LOCATING THE SOURCE OF THE INFESTATION AND DISPOSING OF IT, ALL WITHOUT EXPOSING YOURSELF OR YOUR FAMILY TO ANY HARMFUL CHEMICALS.